"Peace is merely the absence of aruetii opposition." Su'cuy Gar! Welcome to Fett1138.net! Official Home of the Followers of Mandalore! Welcome visitors, to the official home of the Followers of Mandalore. To navigate the website, please use tabs at the top of the page, they can be found on all the pages. If you wish to join the Followers of Mandalore, by all means, click the register button in tab bar at the top, then check in on the introductions forum. Thank you for visiting our website, enjoy your stay. Fett1138.net was created as the personal website of Fett 1138 and official home of the popular Facebook group, the Followers of Mandalore. Fett1138.net was founded October 9, 2009 after years of learning HTML, building pages, purchasing a domain, buying hosting, and other website related things. Fett1138.net was upgraded featuring CSS templates on October 13, 2009, four days after first starting. Fett 1138 was updated again, on December 22, 2010, to a system featuring Simple Machines Forums, and now features membership, forums, and more! 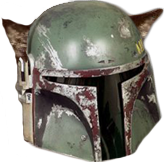 Fett1138.net is now the one and only official home of the Followers of Mandalore. Star Wars, Fett, THX-1138, Mandalorians, and the Mandalorian Skull Logo are registered trademarks of Lucasfilm Ltd., a subsidiary of the Walt Disney Company. All other imagery is either royalty free or self-created. Fonts used in the logo are "Mandalorian", "Metal Rebel", and "Dark Katarn", by Erikstormtrooper, "RedFive" by Fonthead.com, and "Aurebesh" by David Occhino Design. This is an unofficial fan site and is in no way affiliated with Lucasfilm Ltd or any of its licensees and there is no financial gain involved in the activities of Fett1138.net or the Followers of Mandalore. This disclaimer reflects the views of the Fett1138.net team and does not necessarily apply to the events that take place on the forum, as we have little control over what is said there, though the forum is regulated and we make our best effort to keep it compliant with copyright laws and to our disclaimer. Due to excessive spamming, and a security breach on Fett1138.net's sister site Old Time Blues, combined with the extremely low amount of activity here, new member registration for Fett1138.net is now closed indefinitely. If you are interested in registering for Fett1138.net, please inquire on the Followers of Mandalore Facebook page or group. Fett1138.net Once Again Up and Running! Fett1138.net had some downtime today (May 27, 2015) for hosting maintenance, but should now be up and running correctly alongside our new sister site, Old Time Blues! After shutting down LucasArts, Disney has granted Electronic Arts, including subsidiaries such as BioWare, the exclusive rights to produce Star Wars games. Happy Star Wars day, and May the Fourth be with you! "You can't rule Mandalorians. You just make sensible suggestions they want to follow. And since when have Mandalorians needed to be told what makes sense?" The Followers of Mandalore is a non-roleplaying organization that is spread out throughout the world in many devoted members and through a number of mediums, we have many members that participate in costuming, gaming in MMOs, and general internet discussion. We are real people who follow the teachings and beliefs of the Mandalorian culture. For us Mandalorian is not a hobby, its a lifestyle. An unofficial Mando'ade fan club, for true Mandos. The goal of Followers of Mandalore is not to be a single Mando'ade clan, but a central organization, made up of Mandalorians from many clans to form one powerful guild of Mando'ade united as a whole. Motto: For One, For All, FOR MANDALORE!